Since coming into to Cameroon, I have seen billboards showcasing their women national team, the Indomitable Lionesses, and not only that, they have been hailed in almost every cab we've entered, while their male counterparts are whipped with words. This explains how much the title would mean to them if they eventually win it. Many of them are even looking forward to a Cameroon vs Nigeria final. My Sunday morning was used to write stories ahead of the Nigeria versus Mali match, do a report for Today 95.1 FM, while we monitored the Falconets' 2-1 victory over Spain at the U20 Women's World Cup in Papua New Guinea. Then at about 12:15, Jessica Amadi called me to break the cheering news that she had gotten her confirmation letter from CAF. Immediately, Faith Oluchi checked and saw hers. But there was no new message in my inbox. Jessica and Faith told me to be patient that mine was coming. I left my email open, and at 12:20 I got my own confirmation letter. My leap for joy was unexpected. I just could not imagine how I could write match reports and all, sitting in the spectators area with my laptop on my laps (that is, if I would actually dare to bring it out). What would have been the need to come all the way from Nigeria, if I can't attend Press Conferences or go to the mixed zone? Now that Faith, Jessica and I had our letters, we needed to get our tags, but first, how do we get into the stadium? I will get to that. Mr. Moses, Sam, Faith, Carine, her brother and I, went to Limbe in a bus that had been hired by the Mayor of Kumba 2 for Nigerian fans headed for the stadium. We were lucky to meet the bus as soon as we walked to Mile 17 junction from the house. And we were allowed to join them since we were also going to the stadium. It was a noisy journey, but it was worth it. A bus filled with songs, chants and whistles. One fan sported the Nigerian jersey, while some others had the Nigerian flag or a muffler. They were ready. When we alighted at the stadium, the conductor of the bus started asking us for money, saying that it is only those that entered from Kumba that will not pay. We were not told anything of that sort from the start, so we didn't understand why this guy wanted to make extra change off us. Anyway, getting our tags was priority at this point. Jessica called me on the phone about three times on our way. Remember, she stays in Limbe already. So the plan was to meet at the stadium. Sam had his tag already, so Faith and I tagged along. We showed our ID cards where we needed to and eventually made our way into the stadium from a different gate. This was not the gate where Jessica was waiting for us. We did not even know until today that there was more than one gate to the Limbe Omnisport Stadium. At the other gate, Jessica had showed them every necessary document that tells she is an accredited journalist, but the officers there insisted that without her tag, she cannot enter, unless she buys a ticket, or calls someone that will come and identify her. She contacted the Media Officer of the Super Falcons, Remi Sulola who helped in that regard. Meanwhile, Faith and I went straight for our accreditation tags, and it was a huge relief when we could finally hang it on our necks. Afterwards, we located the media tribune in the stadium and got settled at about 15 minutes to kick off. Jessica later joined us, then Tobi and Busayo too. 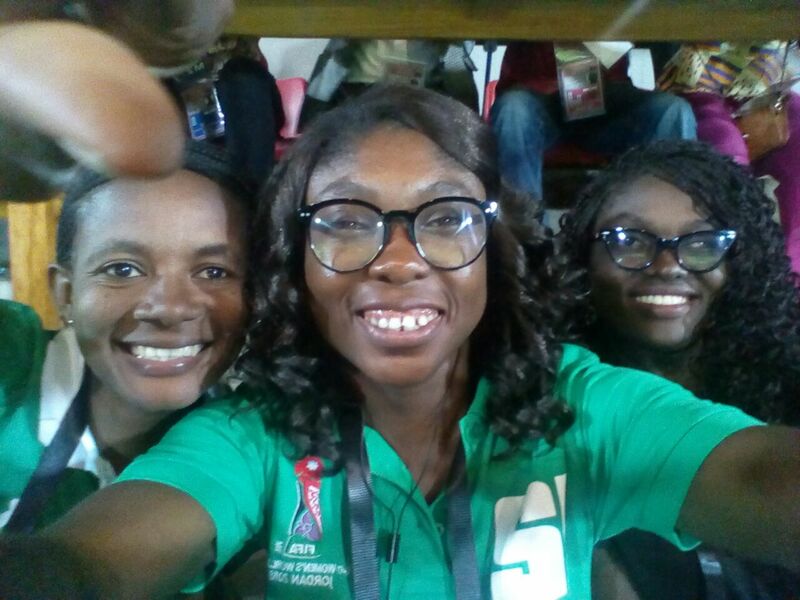 Tracy, my Cameroonian friend, who was also at the Jordan 2016 AIPS Young Reporters Programme, sighted me from a distance before the match between Nigeria and Mali started, and I was so happy to see her. The match started slowly and soon the goals began to pour in for the Super Falcons, while their goalkeeper, Jonathan Alaba was on holiday. Asisat Oshoala displayed intimidating pace, left right and centre, scoring four goals in the process. Fans of both teams were represented, but the deafening noise from Nigerian fans made it seem like they were the only ones around. As I watched Nigeria beat Mali 6-0, I also admired the sea from where I sat. And the breeze was amazing. After the Nigeria versus Mali match, was the Ghana versus Kenya match. It seemed like most of the spectators were in support of Kenya. They scored the first goal but eventually lost 3-1 to the Black Queens. We came back home at about 11pm, hungry and tired. Mr. Moses and Carine went out to look for what we will eat, but they could only return with bread and sardine. One Sardine, CFA 500. Well, we ate and slept.